As Morgue Drawer Four begins, small-time car thief Sascha “Pascha” Lerchenberg is making the score of a lifetime: a Mercedes-Benz SLR McLaren. Before delivering the coveted automobile to his shadowy Eastern European buyer, he decides to help himself to whatever goodies might be stashed away in the car’s interior. He quickly pockets a wad of cash under the seat, passes on the condoms in the glove department, and freaks out when he finds the dead, naked woman in the trunk. Before he can dispose of the body, the buyer’s henchman finds him, demands the keys, and drives away the Mercedes, apparently unaware of its extra passenger. Paid and happy to make a dent in his massive gambling debts, Pascha indulges in his favorite pastime: getting sloppy drunk. Then, while stumbling along a makeshift pedestrian overpass, his senses, dull as they are, unmistakably feel a push on his back that sends him headfirst over the edge to the pavement twenty feet below. Not long after his gruesome trunk discovery, Pascha joins the mystery woman in the great beyond. But the great beyond turns out to be not so far away, as his spirit remains on Earth in a permanent out-of-body experience. Suddenly he finds himself in the morgue with a story to tell and a lot of unanswered questions. And the only person who can hear him happens to be the one slicing his former self open with a scalpel: Ace pathologist Dr. Martin Gänsewein, who knows a thing or two about death but conversing with a cadaver isn’t one of them. Once shy and scrupulous, Martin realizes he’s not losing his mind, and that Pascha’s death was more than just a drunken accident, he becomes an unlikely investigator with a very unlikely informant. Together they delve into the criminal labyrinth beneath the city where they learn there are a lot of people in Cologne, and elsewhere, who had reason to want the car thief dead. Pascha wants closure if not revenge, and Martin wants to help him get it without the becoming the next member of the afterlife. No matter what, the truth must come out—even if it has to come from beyond the grave. Morgue Drawer Four won Germany’s prestigious Friedrich Glauser Prize for best crime novel of 2010, and it’s easy to see why after reading this humorous, and darkly refreshingly original crime novel. Martin Gänsewein is a great character, and strong enough to carry a series of books, more of which have been promised for next year. 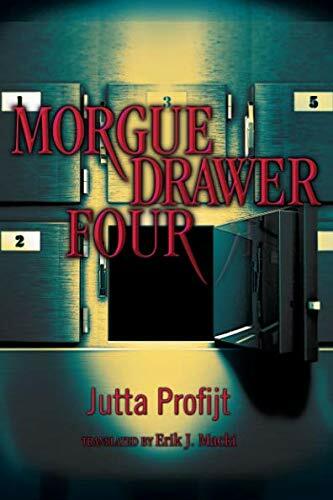 In total, Morgue Drawer Four, a finalist for Germany’s 2010 Friedrich Glauser Prize for best crime novel, is a real find for aficionados of black humor and the macabre. Confident dialogue and fluent writing makes the suspension of disbelief possible, and carries the story along at terrific pace. Jutta Profijt is a name to watch out for.